Advocate staff photo by Danny Monteverde -- A building in the 800 block of Royal Street in the French Quarter partially collapsed Tuesday evening and then continued falling down into Wednesday. Advocate staff photo by Danny Monteverde -- The remainder of the facade of a French Quarter building that partially collapsed Tuesday night came down Wednesday afternoon as city and fire officials worked to stabilize it. Advocate staff photo by JOHN McCUSKER -- A building in the 800 block of Royal Street in the French Quarter partially collapsed Tuesday evening and then continued falling down into Wednesday. 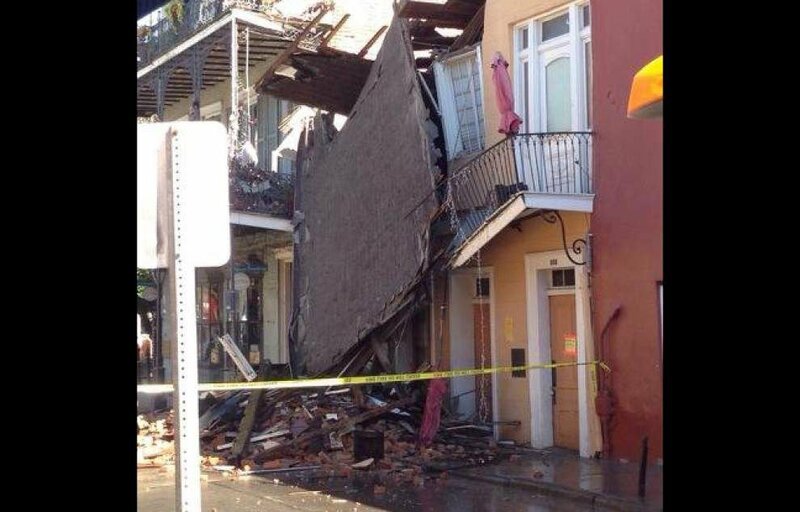 Virtually all of a French Quarter building, more than 200 years old and considered an important architectural feat when it was built, collapsed Wednesday in a spectacular cascade of dust, dirt and debris as officials tried to stabilize it after a portion had tumbled to the street below a day earlier. By late afternoon, an excavator was trucked into the 800 block of Royal Street in anticipation of demolition of the entire three-story building Thursday morning. Neighbors said much of the building, which had been cited for “demolition by neglect” a few years earlier, was a dilapidated mess even before the incident. The majority of the building’s façade and roof crashed to the ground about 1 p.m. Wednesday, sending up a cloud of dust and forcing some onlookers to run for safety, just moments after Fire Chief Terry Hardy spoke to a reporter about efforts to stabilize the structure in a way that would not damage neighboring buildings. Though sudden, the collapse was not totally unexpected, as smaller portions of the building had fallen off during the morning. Part of the second- and third-floor façade and a balcony had collapsed late Tuesday afternoon. 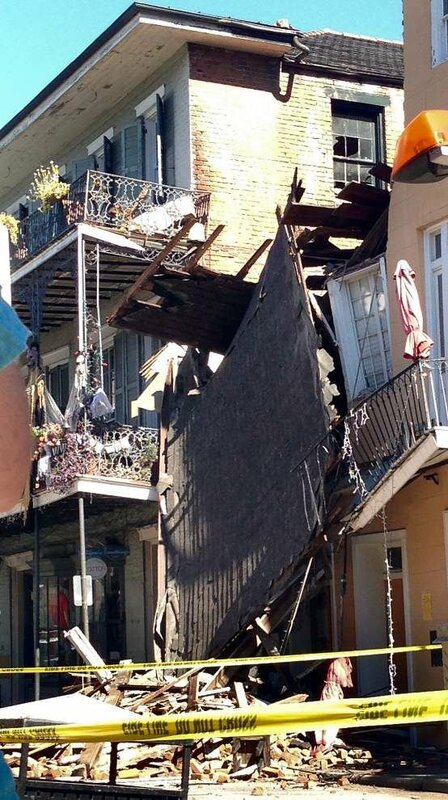 The collapse was a “harsh” reminder about the importance of protecting the buildings in the city’s oldest neighborhood, said Meg Lousteau, executive director of the Vieux Carre Property Owners, Residents and Associates. The building at 808-810 Royal St. is owned by Elaine Petrie, according to Orleans Parish Assessor’s Office records and neighbors. Attempts to contact her were unsuccessful. The building, which included three apartments, was cited for demolition by neglect in 2011, said Hayne Rainey, a City Hall spokesman. The violations on the exterior that the Vieux Carre Commission noted at that time were subsequently repaired, he said. However, any internal or structural problems that might have weakened the building would have been unknown to the commission’s inspectors because they are not allowed inside buildings. Lary Hesdorffer, director of the Vieux Carre Commission, said there were no outward signs, such as rot, that anything was wrong with the property after the violations were corrected. “It was in passable condition,” he said. Many neighbors, though, said the back of the building, out of view from the public, was in deplorable condition. Sherry Dooley has lived next door for three years. She said a deteriorating wall of 808-810 Royal St. that backs up to the courtyard of her apartment building and the lack of tenants gave her the impression it was abandoned. “It looked decrepit,” she said. The back portion of the structure had many missing clapboards and open windows; it appeared not to have been painted in years. A large crack snaked up the back wall, which appeared to be covered in stucco or concrete. Dooley and many others who lived in neighboring buildings spent Tuesday and Wednesday looking for temporary lodging because they could not return home. Edward and Suzanne Robicheaux, the building’s lone tenants, said they, too, would have to find a new place in the Quarter. The Baton Rouge couple said they had rented the second-floor apartment and used it as a weekend getaway for the past 21 years. Edward Robicheaux described the building as being adequately kept up. He said it was repainted two or three years ago, about the time the VCC cited it. The couple said they lost all of the belongings in their unit. The building was constructed in the early 1800s. The city said it was built in 1810, but Historic New Orleans Collection records indicate it dates from 1801. “These buildings were famous in their time as being among the first, if not the first, three-story buildings in the Vieux Carre,” according to the HNOC’s Collins C. Diboll Vieux Carre Survey. While an excavator was brought to the site Wednesday afternoon, demolition would not begin until 7 a.m. Thursday, Rainey said. The age of the building required the city to obtain a special Department of Environmental Quality permit, and adjacent property owners still had to get into their buildings to make video records of their condition for insurance purposes. Time also was a factor because it was nearing dusk when the equipment arrived, Rainey said. New Orleans police and fire officials would remain on the scene and keep the site blocked off until the building is torn down and the debris cleared, he said. While preservationists and city officials mourned the loss of the two-century-old building, they breathed a sigh of relief that no one was injured either day. “It could have been worse,” Edward Robicheaux said. The 800 block of Royal remains closed to traffic. Follow Danny Monteverde on Twitter, @DCMonteverde.